For a full listing as of Aug 2013, click here. Selected Petron gas stations are also part of the network already. In its effort to reach out to more buyers abroad with no credit cards, Dragonpay has tapped into the network of I-Remit, the largest non-bank, Filipino-owned remittance company. With this new development, overseas Filipinos can now avail of products and services from Dragonpay e-commerce merchants either for themselves or for the benefit of their families back home in the Philippines. I-Remit is the first publicly-listed remittance company. It went public in 2007. It is currently estimated to account for 6.5% of remittance inflows into the Philippines. Dragonpay featured in Issue #26 of the Asian Entrepreneur (https://www.facebook.com/TheAsianEntrepreneur). Dragonpay cited as one of "10 startups that can beat PayPal in Southeast Asia"
Regional Tech Industry watcher TechInAsia recognizes Dragonpay as a strong PayPal contender in the Philippine market where alternative payments are very common and popular. Check out the the Philippines Startup Report prepared by Ron Hose to get a good idea of the Philippine e-commerce scene. Robinsons Department Store (RDS), the flagship retail chain of the Gokongwei group, now accepts Dragonpay over-the-counter payments at its Business Center counter. Customers can purchase online from any merchant accepting Dragonpay, then go to an RDS Business Center to pay. The service is available at all RDS branches nationwide. RDS Business Centers accept payments daily (Mon to Sun) up to 7pm. Payments are processed and posted by Dragonpay at the end of the day. Other Gokongwei businesses include real estate (Robinsons Land), retail (Robinsons Supermarket, Toys 'R Us), manufacturing (Universal Robina Corporation), and many others. Until recently, it was a major player in the telecommunications industry through Digitel and Sun Cellular. The group sold their telecommunications business to the PLDT group. Customers can now pay at Security Bank via online, over-the-counter or ATM for purchases made from Dragonpay merchants. Payments are processed end of day. Weekend payments via online banking and ATM are processed on Mondays. Security Bank has been embarking on a major expansion since late 2012. New branches are opening in several areas nationwide. The bank also bought out a small savings bank and converted it into its savings bank arm, Security Bank Savings. The bank has introduced innovative services such as the electronic GC (e-GC) which allows anyone to withdraw from a Security Bank ATM supporting the feature -- even if you are not an account holder and do not have a Security Bank ATM card! Depending on where your location is, Dragonpay has 2 types of over-the-counter payments at BDO -- Regular Cash Deposit and Bills Payment. Make sure to exactly follow the instruction that you receive as paying in the wrong channel can cause delays in processing. From the merchant website, you will be redirected to Dragonpay's payment selection page. Select Banco De Oro Over-the-Counter (OTC) as your Fund Source. Choose among the available branches from the secondary dropdown list. 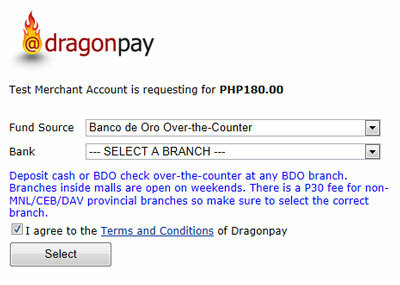 If the amount is at least PHP200.00, Dragonpay will send you an instruction to perform a Bills Payment. An extra service fee of PHP30.00 will be added to the amount due. This will actually come out better for you because the BDO branch will no longer charge you the PHP50.00 handling fee for depositing to a branch outside your province. So in reality, you are saving PHP20.00. Click this link for more information about paying via Bills Payment. However, if the amount due is less than PHP200.00, Dragonpay will send a regular Cash Deposit instruction to its Manila branch account. So while we will not add any service fee to the amount due, the BDO branch in your area will most likely charge you the provincial handling fee of PHP50.00. Basically, just make sure to select the correct branch and our system will automatically figure out the best option for you. If you ever make a mistake and paid the wrong amount (ex. you did not add the PHP30.00 extra fee for Bills Payment) immediately contact us for assistance. NOTE: For customers based overseas whose only way to make a payment is through bank wire transfer, please choose "Metro Manila / Outside Philippines" as the bank branch to force our system to use the standard Cash Deposit instruction. Bills Payment will not work for international payments.